If you are pouring a concrete slab for cement floors or concrete patio slab it is extremely important to make sure everything is ready prior to the cement truck pull up to your project. You don’t want to be caught short-handed in the middle of the pour especially for diy concrete slab. Should this happen the cost concrete slab to fix can be very high. Pouring a concrete slab requires a concrete finisher with experience to properly finish your floor or patio. A poor job in finishing your floor slab or patio can cause hundreds if not thousands in repair, worse still you might have to replace the slab. 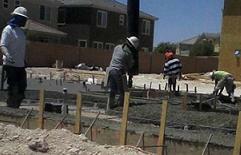 Once the cement truck is at your project, you have one shot at finishing the slab correctly. I suggest instead of buying concrete finish tools, invest in hiring a concrete finisher that already has tools. Try calling a few concrete contractors on the yellow pages or search on the internet for local concrete contractors and ask for a bid just to pour and finish 600 square feet concrete. This should be 4 to 5 hours job for one good finisher and you as a helper, cost around $150-$200+/-. If he brings a helper it will cost more but up front tell him you will be there to help. If he insists on bringing a helper, he may not be up for the job. If his bid is reasonable, check out his work. Ask if he has a pour for you to see his work. Contractors that do business with ready-mix concrete companies get their concrete at discount anywhere from $15 to $20 per cubic yard less than a homeowner. If you don’t have contractor connection, call up all the ready-mix companies in town and shop for prices. It is extremely important to watch the weather, the biggest enemy for concrete slab is rain, never pour concrete slab in the rain. Footings and foundations at rain are not too bad, slab is a different story. I have done it too many times and every incident is worse than the previous – it is not worth it. You need to coordinate the pour with your finisher. If he is only available after work or weekend, schedule the pour accordingly. This is important, if you are new to concrete work, this step is a must. After placing the order, ask the dispatch to send someone to your project site to check if his truck can reach the slab pour without damaging private properties. Low power lines, narrow streets, tight turns are some of the reasons concrete trucks can't get to your project. If for some reason your concrete can't get to your pour, you need a plan B. Pouring a concrete slab for those with less experience is hard work. Believe me, you don't want to start your plan B when your concrete is at your driveway. Yes I have had those surprises too and it is not a good situation. If it takes you too long to unload the concrete i.e. using wheelbarrows to unload or concrete finisher lack of experience, you will be charged extra. When ordering the concrete ask how much time you have to unload the 8.5 yards before they charge you extra. Planning a head makes all the difference for a more successful project.